KRION PORCELANOSA Solid Surface, as a state-of-the-art material, is at the forefront of obtaining the most demanding global certifications. The multitude of applications and sectors in which KRION is an ideal material, expands the number of certifications that KRION, accompanied by PORCELANOSA Group, is obtaining worldwide. 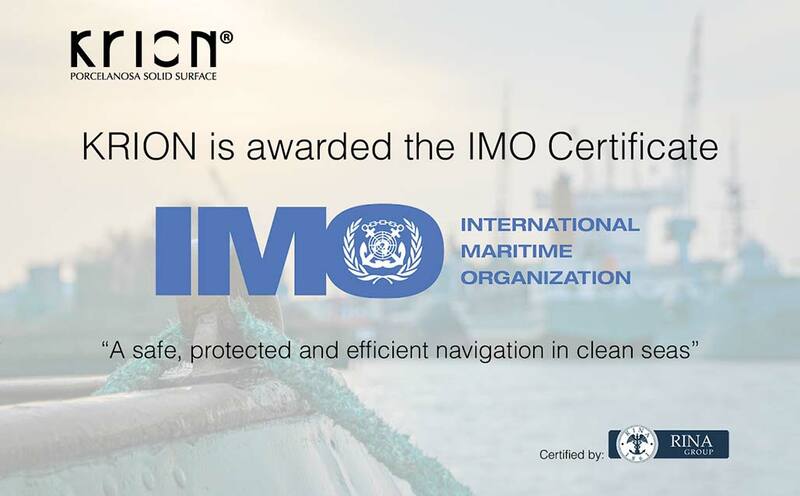 Today we set off from a good port with the IMO Certificate (International Maritime Organization), certification in the nautical sector whose motto is “A safe, protected and efficient navigation in clean seas". The International Maritime Organization (IMO), is a specialized agency of the United Nations that promotes cooperation between States and the transport industry, to improve maritime safety and to prevent marine pollution. Therefore, the IMO is the world authority in charge of setting standards for safety and protection in maritime transport. The measures adopted within the IMO cover all areas of international maritime transport, including the design, construction, equipping, manning, operation and scrapping of ships in order to ensure that this important sector continues to be safe, ecological and efficient in terms of energy and environmental protection. KRION, as a New Generation material, concerned with offering its customers a material that conveys who they are, whilst providing comfort and safety, has obtained the IMO certification that authorises the material to be used in the equipment of vessels. These tests were carried out in an independent institute accredited by IMO , RINA Group, one of the few worldwide that are authorised for this. It should be noted that KRION has obtained the IMO certification for its STANDARD material. Meanwhile, some of the most internationally recognized solid surface brands of prestige have obtained this certificate using specific formulations to improve fire resistance (with the economic outlay that this entails), this information is reflected in its technical specifications. Having obtained this certification KRION enters the maritime sector, a very powerful and important industry, which includes engineers, architects, interior designers, etc. dedicated exclusively to this sector, in which KRION can be used as a coating, decoration, for kitchens, bathrooms, sign making, furniture, etc.